J.M.C. Van der Veken is a Belgian jewellery company, founded by Joseph Van der Veken in 1952. From the beginning, we have always crafted our jewellery entirely by hand. Strictly observing the rules of the craft and without ever making compromises on quality. Handcrafting makes for a much more fine, beautiful and solid jewel. It also enables us to finish and polish the tiniest details, even the ones you cannot see. In 1952 Joseph Van der Veken, aged 23, set up his gold smith workshop in a tiny rented office in the heart of the Antwerp Diamond District. The exceptional quality of his craftsmanship soon grabbed attention and he specialized himself in crafting ‘High Jewellery’. After a few years demand was so high that he needed to expand quickly. The adjoining rooms were added to the workshop and additional goldsmiths were hired. In 1968 the company moved to the Rijfstraat where a boutique was also opened. From this humble shop customers from all over the world were served. From American tycoons to African princesses, they all found their way to the Rijfstraat. During all this time the focus remained on creating the most exceptional jewellery in the traditional, artisanal way. Ten years later, Joseph’s son Christiaan joined the business and in 1996 he took over the company. In 2007 the shop, atelier and offices moved to a newly constructed building in the Vestingstraat. That same year the third generation entered Van der Veken Jewellery when grandson Steven started working in the business. In 2014 we were the first jeweller to be awarded the Antwerp’s Most Brilliant Label (AMB) by the city of Antwerp and the Antwerp World Diamond Centre (AWDC). The AMB label certifies jewellers who meet 30 very strict criteria with regard to quality, durability, security, trustworthiness, transparency and service. A lot has changed during our 65 years in business, but our love and dedication to the craft will always remain the same. We keep making jewellery just like we always have done: completely artisanal and by hand. Each component is carefully crafted and finished by hand and soldered together to an exquisite jewel. Today we remain one of the very last independent ‘High Jewellery’ ateliers in the world. 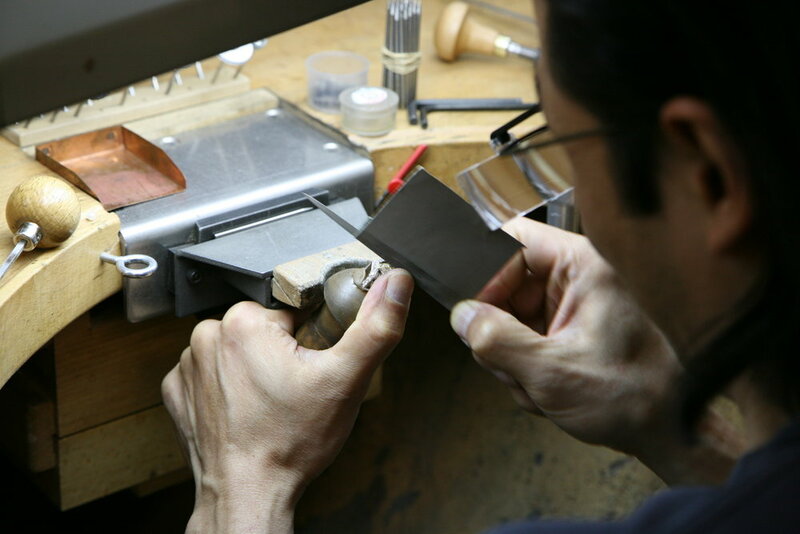 At Van der Veken Jewellery we forge each jewel entirely by hand. This makes us unique in the jewellery business. 99% of all jewellery is made using some form of casting. Even pieces marketed as 'Handmade' or 'High Jewellery' and made by reputable houses are almost always made by casting metal in a mold. The problem with casting is that it turns metal brittle. This in turn makes the jewel fragile and more prone to wear and tear. However, at Van der Veken Jewellery we remain devoted to the artisan craft. We forge each component, no matter how small, completely by hand. Next we polish it to a mirror finish. Only then do we solder all parts together to form the finished jewel. This makes for a much more refined result that is more flexible and stronger. All Van der Veken jewellery enjoys a lifetime warranty.